Sensing a bigger credit risk on the government’s Mudra loan disbursement to the tune of Rs 6 lakh crore till date, mostly to first-time entrepreneurs, the lender community has expressed concerns in this regard to the finance ministry and sought stricter procedures to prevent the segment from becoming the latest poster boy for bad loans. 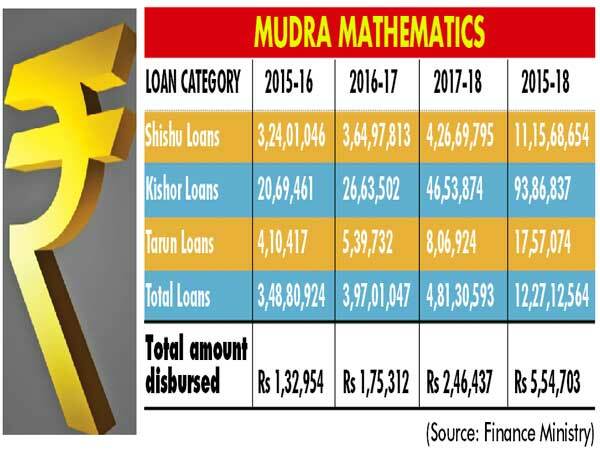 The lenders have a genuine concern on Mudra loans as these constitute small sums in the range of Rs 50,000-Rs 10 lakh but are without any collateral. The probability of them turning into non-performing assets (NPAs) is also high. Raising an alarm, the chief of a leading public sector bank, requesting anonymity, told FC that though credit growth is recovering banks may come under a fear cloud. “We are happy that Pradhan Mantri Mudra Yojana (PMMY) is an encouraging scheme which generates self-employment and instil confidence among jobless people, but at the same time its recovery from the loan takers is not guaranteed as the tag of no-collateral is attached to it. Therefore, we urge the government to find out a proper mechanism to prevent this small loanee segment from becoming bad loans and protect bankers as well,” he added. In the last meeting of Parliamentary Standing Committee of Finance, chiefs of state-owned banks, including SBI and PNB, expressed similar concerns on the issue of Mudra loan fallout. “We are discussing NPAs today. At one stage that credit growth is recovering and at another stage only a few sectors are doing good. What is the percentage of retail lending by the banks? What is sector-wise growth of lending across sectors? For example, the government is saying that a lot of money has been disbursed under Mudra, to the tune of Rs 6 lakh crore for over 12 crore consumers have been given the Mudra loans in which there is no need to produce collateral from the loanee side. Do you not see that it would pose a big NPA problem in the near future?” asked the CMD of public sector bank quoted earlier. The PMMY scheme was launched by prime minister Narendra Modi in April 2015 to improve access to micro finance for non-corporate, non-farm small/micro enterprises and stimulate job creation in the country. Any individual can apply to private or public banks for loans of up to Rs 10 lakh without having to provide any collateral. PMMY scheme is mainly divided into three categories — Shishu Loans, Kishor Loans and Tarun Loans. The government has already disbursed around Rs 5,54,703 crore till date to almost 12 crore consumers. Out of three categories, Kishor Loans has given out its loans to maximum number of consumers (93,86,837 people) in last three years. (see table). But the bankers have different view on this issue. “The total amount of NPA, including priority sector and non-priority sector, is beyond anybody’s imagination. If you can go through the composition of NPAs of public sector banks since 1995, the total amount of NPAs in 1995 was Rs 38,300 crore. Till 2009 it was hovering between Rs 38,300 crore to Rs 45,000 crore or Rs 50,000 crore and Rs 53,200 crore. After that, in 2010 it has surged to Rs 59,900 crore, while in 2015 it was Rs 2,78,400 crore. But in 2017 it reached to almost Rs 684,732 crore,” the banker said. Traditionally, financial institutions have preferred to lend to larger companies that are able to provide collateral, instead of lending to micro, small and medium enterprises (MSMEs), which are often run by first-time entrepreneurs often believed to represent greater credit risk. According to a March 2018 report of the Small Industries Development Bank of India (SIDBI), the NPA ratio for PMMY loans of up to Rs 10 lakh, which the government includes under Mudra, was 11.5 per cent in December 2017, “The overall recognised NPA exposure for MSME is Rs 81,000 crore as on March 2018, said a joint study conducted by CIBIL & SIDBI. “The Reserve Bank of India (RBI) on June 6 came out with a special dispensation for encouraging formalisation of MSMEs. The NPA of the PSBs has increased from 14.3 per cent in March ’17 to 15.0 per cent in March ’18 (11.9 per cent, March ’16) and the NBFCs have also witnessed an increase in NPA rates from March ’16 to March ’18,” the report added.